While the latest edition of El Clasico might not have direct title implications in La Liga, given Barcelona's 10-point lead over Real Madrid, Saturday's Camp Nou showdown does see Lionel Messi and Cristiano Ronaldo face each other once again. Francesc Tomas (Barcelona) and Rob Train (Real Madrid) discuss their club's star ahead of the latest meeting. How have Messi and Ronaldo played this season? Francesc Tomas: Messi has been Barca's spiritual leader for the better part of the past decade, but his importance after the departure of Xavi and the arrival of Luis Suarez has reached new heights. No longer a promising youngster but an undisputed, inspirational leader, the No. 10 has an impressive 22 goals and 10 assists in his 25 appearances in La Liga this season. Most importantly, his increased maturity and generosity have played a vital role in the outcomes of others, particularly Suarez (already on 26 goals in the league) and Neymar (21). Rob Train: The bulk of Ronaldo's 28 league goals have been scored against second and third-tier sides: He has eight against Espanyol alone. When facing the more illustrious sides, though, he has been mostly anonymous. He disappeared in games against Atletico Madrid and Villarreal and managed just two shots in the last Clasico, against a season average of 6.3 per game. But talk of Ronaldo as a flat-track bully is inaccurate. He has done it in big games... just not recently. What is the view of them among their own fans? FT: Messi is Barca, it's as simple as that. Whether you pop into a local market or sit down for a quick drink surrounded by tourists, the No. 10's presence is never too far away. Cules' love for their world-class star is such that Messi shirts, figurines, sweets, bedding, bottle openers, scarves and even crisps are constantly flying off the shelves. Despite having enjoyed the brilliance of Ronaldinho, Johan Cruyff and even Diego Maradona at the peak of their careers, Catalans rightfully consider La Pulga the club's best-ever player. He represents the essence of what La Masia and Barca's philosophy is all about: talent, perseverance, endless creativity and winning. RT: Ronaldo is a tricky one to pigeonhole. For all the "look-at-me" stuff, his off-pitch reputation is a lot better than some of his teammates, and he comes across as being generous with his time and his money. But the fans are divided, more so than with any other player. If he has a bad game, the whistles rain down. If he scores four, adulation pours. Recent comments about his teammates, whether misinterpreted or not, hardly helped his cause, and he will never be held in the collective heart like a Raul or Roberto Carlos. However, there is no doubt the majority of fans would rather have Ronaldo in their team than lining up against them. 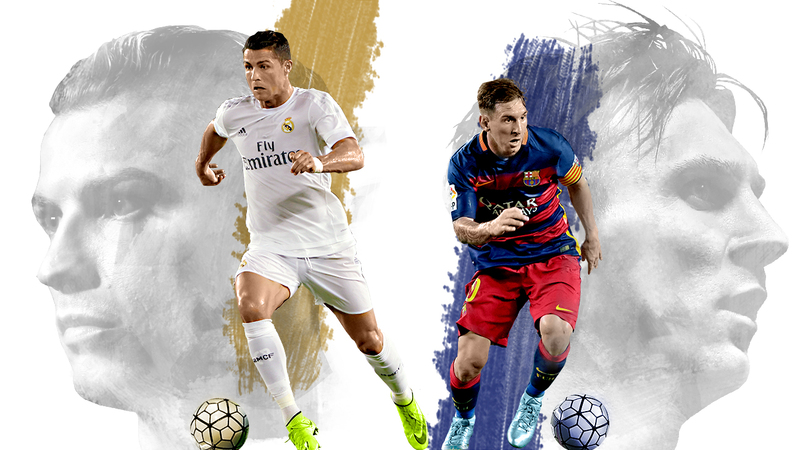 What do Barca fans think of Ronaldo and Madrid of Messi? FT: The Camp Nou faithful love to hate Ronaldo. His haughty attitude, tendency to prioritise individual to collective success and, perhaps more importantly, undeniable status as one of the world's best-ever goal scorers make him the perfect target for Cules' jeering. The clear antithesis of Messi, the Portuguese's attitude could not be further from what Catalans consider the model professional. Ronaldo's insistence on shutting up the crowd whenever he scores a goal in the Catalan capital is a clear indication that the love between both sides is mutual, which comes as no surprise. Cristiano Ronaldo is the man Barcelona faithful love to hate. RT: Real fans can be exceptionally harsh toward their own but surprisingly gracious toward opposing players. Ronaldinho received an ovation at the Bernabeu in 2005, 22 years after Diego Maradona had the stadium on its feet. Andres Iniesta had a mixed reception in Barca's 4-0 November victory. Will Messi ever be afforded the same affection? Probably, but only when he's playing his last match at the Bernabeu. Until then, he's too much of a thorn in the side to be lauded from the stands. How have they played in past Clasicos? FT: Having found Real Madrid's net on 21 occasions, including a record two hat tricks, Messi is the all-time leading scorer of El Clasico. Having also contributed a remarkable 13 assists in his 31 appearances to date, it would be fair to say the pint-sized Argentine has been terrible news for Los Blancos for more than a decade. Since making his professional debut, Messi has won 15, drawn seven and lost only nine of the 31 matches he has played against Real. RT: Since Ronaldo's 2009 arrival at the Bernabeu, Real have won three, drawn two and lost six in the league against Barcelona. In the Copa del Rey since then, Real have won three, drawn two, lost one. Taking into consideration everything Barcelona have achieved in that time, the record isn't too grim. Ronaldo has bagged 15 Clasico goals in all competitions, which is level with Raul. Only Messi (21) and Alfredo Di Stefano (18) have scored more. What was their best Clasico moment? FT: Fortunately, there have been many highlights to chose from, but one memory stands head and shoulders above the rest: 19-year-old Messi putting three goals past Iker Casillas in the 2007 Clasico. Messi's passionate, magical hat trick will forever hold a special place in Barcelona hearts. It was the moment he stepped ahead of mentors Ronaldinho and Samuel Eto'o to take centre-stage in the biggest game in world football. There is perhaps no greater moment in Lionel Messi's Clasico career than his hat trick in 2007. RT: Probably his towering header to win the 2011 Copa del Rey final, which was his first trophy success at Madrid. Ronaldo also scored the winner in an April 2012 game at Camp Nou, which was Real's first victory at Barcelona in almost five years. The sides' next meeting, in October of the same year, was arguably the only one that has yet lived up to the Ronaldo vs. Messi hype, as both players scored twice in a 2-2 draw. Aside from Messi and Ronaldo, name one player who will be especially important on Saturday. FT: Luis Suarez. Always ready for the physical battle and known to raise his level when under pressure, the Uruguayan will be relishing the chance to cause mayhem within Real Madrid's backline. His relentless energy, dynamism and ability to connect with either Messi or Neymar, even when in tight spaces, could be the decisive factor to tip the balance in the Catalans' favour. Having already found the net on 26 occasions in the league this season despite taking only 3.8 shots per game, Barca's No. 9 will keep goalkeeper Keylor Navas busy. RT: Keylor Navas. It is next to impossible to stop Barcelona from peppering your goal with shots. Villarreal tried it in a 2-2 draw recently, playing with two banks of four when not in possession. They made 20 tackles, racked up 17 fouls and incurred eight yellow cards, yet Barca still had 15 shots. Navas has been in excellent form this season and will need to be at the peak of his powers on Saturday. What is your prediction for Saturday's result?